World of Lazarus: It’s Time to Organize! Players coming to World of Lazarus from other Green Ronin titles are probably vaguely familiar with the organization rules used in the Dragon Age Roleplaying Game, Fantasy AGE, and A Song of Ice and Fire Roleplaying. This simple, flexible system lets players take control of a noble family, thieves’ guild, mercenary company, or nation of their very own as a core part of the campaign. With the setting’s intense focus on the responsibilities and effects of character’s actions on the world around them, this system is a natural fit for World of Lazarus as well! 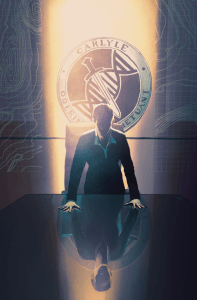 The setting book includes a few sample organizations already, including the Novaya Bratva crime empire and a sample Waste town, but you can make your own as a core part of your own campaign, using adventures to help shape the PC’s organization and their impact on rival organizations. For PCs playing Waste, they might build up their own tiny community and target organizations representing warlord armies, aggressive towns, and the local tax man. Resistance-focused campaigns might instead use the rules to represent the PCs’ resistance cell and network of supporters while their opponents include Family intelligence organizations, law enforcement, and criminal groups looking to pressure freedom fighters into supporting their own illegal empire. For a Serf campaign, organizations can represent anything from rival research groups in a scientific and corporate-espionage-focused campaign to enemy forces in a military campaign. But we already started thinking about a Family campaign last week when I created my own character for a campaign, Carrie Morrow, a loyal but ruthless intelligence agent for the Quinn family, who are desperately trying to hold the Borderland South Sub-Domain together in the face of war and Family power struggles. The PCs can operate their own organization representing to Quinn family and their power base, and for this kind of campaign we’ll want some enemies… Say the local Hock forces eating into the eastern border? And a rival Family hoping to oust the Quinn’s and take their place? And just to keep the players on their toes, we’ll toss in something stealthy… say an up-and-coming dark web media group associated with the Free and prying in to family business. Each of these organizations will need their own statblock, a few named NPCs so the PCs have something human to recognize with their forces, and a modus operandi. But that’s all behind-the-scenes work for the GM. For now, let’s focus on what the players can build: Their own Family! The Quinns are popular and know where all the bodies are buried—controlling the local media outlets and entertainment venues—probably with strong ties to CARSEC, but their lavish lifestyle has left them cash-strapped and perhaps lagging technologically behind what would be expected of a Carlyle house. Organization Focuses can be more abstract than character Focuses, and for the Quinns, we go with Influence (propaganda) and Finance (blackmail); the Quinns can put some serious pressure on people when they need to, making up for their empty bank accounts, but it won’t win them many new friends. Being built with an array, the Quinns begin with a Cohesion of 3 and 28+2d6… 36 Capital. That’s all an organization needs to get started. Now the GM just needs to figure out how frequently the PCs will make Organization checks, which in turn determines the timeline of the campaign. Organization checks once a month means things are hitting fast and hard, with constant struggle and changes in power, while every three months or every six months would be more appropriate for drawn-out political maneuvering in a campaign intended to covered years. The GM wants the campaign to be high-energy and high-stakes, so we’ll go with once a month, usually with a PC-scale adventure somewhere in between Organization checks. A PC organization gives the GM additional hooks for adventures; a bad Organization check may result in a drop in Influence, and the adventure may involve tracking down whoever is trashing the Quinns’ reputation, for example. A PC organization also provides additional options for rewards. The PCs capturing a renown Hock scientist as part of the adventure may provide a free Technology Focus while a remarkable public victory over an opponent in an adventure could restore organization Capital. Especially with an intrigue-oriented campaign, it’s important for the PCs’ personal action to feel like they have larger consequences, and affecting their organization or others is an easy way to represent that! https://greenronin.com/wp-content/uploads/2018/11/screenshot_2018-11-24_14.16.57_1024.png 1024 674 Crystal Frasier //greenronin.com/wp-content/uploads/2017/07/RoninBanner-1.png Crystal Frasier2018-11-26 07:58:232018-11-26 07:58:23World of Lazarus: It’s Time to Organize!